Here are some facts about Bosnia-Herzegovina. 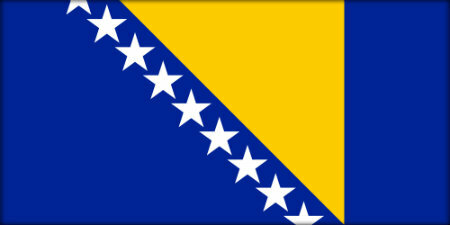 Bosnia-Herzegovina is a small country in southeast Europe, created when Yugoslavia split up into several countries. It covers about 51,000 square km and has a population of 3.8 million. Bosnia-Herzegovina was ruled by the Ottoman Empire from the 15th to the 19th centuries. After World War I, it became part of Yugoslavia, declaring its independence in 1992. It is bordered by Serbia, Croatia and Montenegro. The country is mostly mountainous and forested, and is landlocked except for a 20 km coastline on the Adriatic Sea. Bosnia-Herzegovina has become one of the fastest growing tourist destinations in the world. It has been voted a top mountain biking destination and is also popular for winter sports. Medjugorje is Europe’s third most visited religious site. Mary, Mother of Jesus is said to have appeared there many times, and strange apparitions can often be seen in the sky. Mostar is a popular tourist destination. Its most famous landmark is the Old Bridge, built in the 16th century, destroyed in the 1990s Bosnian War and rebuilt in 2004. Sarajevo is the capital and largest city, with about 600,000 people. It was besieged for over 4 years during the Bosnian War of 1990s, one of the longest sieges of modern times. The Archduke Franz Ferdinand of Austria was killed in Sarajevo in 1914, leading to World War I. It was also the first European city to have a network of electric trams, in 1885. The Bosnian Pyramids are a cluster of hills about 210 metres in height. Some archaeologists believe they are man-made by people who lived in the area up to 14,000 years ago. Bosnian cuisine is similar to Greek and Turkish food and uses many spices. Coffee drinking is part of daily life and Bosnia-Herzegovina is one of the top 10 coffee drinking countries in the world.